Stem Cells Have The Potential of Curing and Reversing Aging Process. Teams of scientists have clinically proved that renewing the hormones of old with young one of the same kind through stem cells. Recently teams of Scientist had proved that blood of young mice when injected into that of old regenerated the muscles and brain. The experiments have proved beneficial to a large extent with laboratory animals and humans. In a nutshell for an idea stem cells can reproduce through the process of mitosis ( duplicating). Although the idea of good health through blood of young was there for long. But, since 1960 the research and development have been going on the world over. In the future, the stem cell technique is going revolutionize the scientific world. Stem cells from a newborn can repair the tissues of the siblings or the parents suffering from incurable diseases. It is being claimed that the grandparents can also help up to an extent. Although the idea of good health through blood of young was there for long. But, 1960 the research and development have been going on the world over. In the future, the stem cell technique is going revolutionize the scientific world. Stem cells from a newborn can repair the tissues of the siblings or the parents suffering from incurable diseases. It is being claimed that the grandparents or senior citizen can also get help up to an extent. 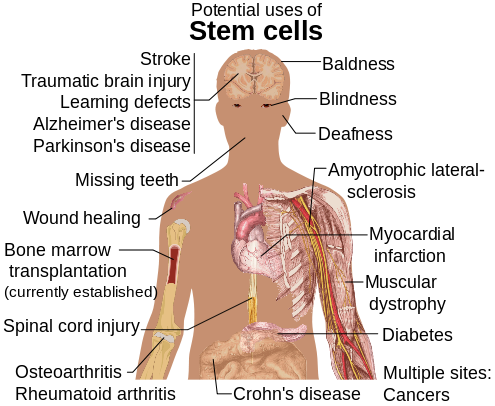 The stem cell science is vast, and advances are being made the world over to get the benefits. It boils down to the fact of using stem cells of the young one for the regeneration of tissues in various organs. Scientist believe that there may be natural chemicals in young stem cells that turn back the clock of affected body part. When talking of humans the stem cells are procurable from different sources of which the least risky is from the Umbilical cord blood soon after birth and also from bone marrow of the donor. There are many conditions and limitations which apply for healthy retrieval of the blood sample. The stem cells with a genetic disorder are to be discarded as soon as possible. Now a days Stem cell banks have started operating on worldwide scale. There are limitations involved, and there is a good cover of insurance available in case of any mishap. All diseases may not get cured through this system, and one should not expect too much.